Tyger Tyger caught my eye with its intriguing title. I learned about William Blake in English my senior year of high school, and I was surprised to see it referenced in a book about goblins. My excitement for this title died, however, very soon after I began reading and in retrospect, I can say that it holds enormous potential, but the essence of this creation was buried under graceless prose, weakened by an unstructured plot, and weighed down with rough characters. It did not rise to my expectations at all. 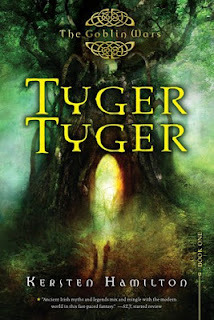 I loved the idea behind Tyger Tyger. An epic story steeped in Irish legends and folklore, richly populated by goblins and Highborn Sidhe -- I expected something dark and edgy and heart-pumping. However, the writing style could not support the delivery of this idea. It was like a rough sketch of what the story was supposed to be like, and therefore lacked dimension and life. For example, the story is from Teagan's point of view supposedly, but there's no spark behind the narrative to suggest that it's being told by Teagan herself, and instead sounds like an omniscient narrator. This created a massive gap between me and Teagan. I felt no emotional ties to any of the characters, not even Teagan's charming little brother, Aiden, who was the epitome of adorable from start to finish. I didn't even feel shock when one of the characters died suddenly because, not only was it precipitated by a huge story gap, but I couldn't grasp the character's death because it had almost no impact on the story itself. In fact, much of the story events lacked impact. There was very little shock value to the action that took place, so the scenes felt haphazardly thrown together with everyone just moseying along. I couldn't identify -- and therefore, could not appreciate -- the stakes. I understood that there was supposed to be a goal and a central conflict, but what drove each character? I felt that, if each character had been given a personal stake in the plot, then they would not have appeared so pale and cookie cutter. Action scenes came off flat, with everyone reacting exactly as expected and without any flavor, or diversity. I could smell the scent of an epic adventure clinging to the core of Tyger Tyger, but it came off as an unexciting lump of unpolished diamond. There were so many kernels of originality that were either passed by completely, or crushed under the graceless writing style. With a little fleshing out, Teagan could have sported more depth, the plot could have risen to a heart-stopping climax and the romance could have been achingly bittersweet, but it was a mere skeleton of an idea. Despite my qualms with Tyger Tyger, I feel I might continue with the series regardless. I'm drawn to the intriguing titles, despite the uninspiring summaries. "You turned red all over, Finn," Aiden said helpfully. "So did Teagan. As red as Kool-Aid." The back of Finn's neck went from pink lemonade to Blastin' Berry Cherry. "Yeah," Aiden said. "Like that." Teagan sighed. "How long has it been since you read a book that didn't have vampires in it?" "They write books with no vampires? Wait...the penguins made us read that Shakesrear guy, right?"